The Carefree Cave Creek Chamber of Commerce has announced their 2018 Business of the Year. The award is given to a business that demonstrates passion for giving back to the community, has experienced significant business growth, and was nominated and voted on by their peers. 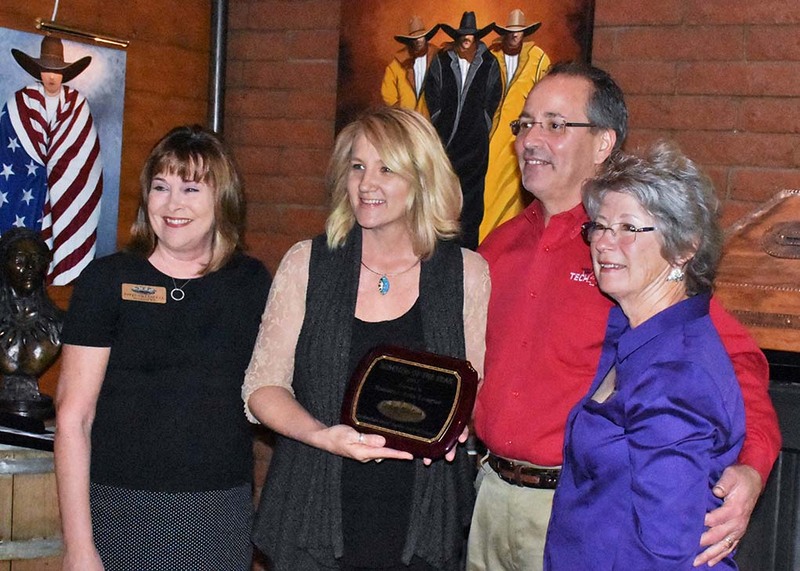 The award was presented Thursday to Sonoran Arts League. The league’s mission is ‘To give to our community by promoting art, artists, and art education through leadership and service in the belief that an artistic awareness is essential to the well-being of life and our community.’ Runners up for the award were Bryan’s Black Mountain Barbecue and Watson’s Hat Shop. Steve Woods, whose company, Tech4Life, was the 2017 winner reminded Chamber members that ‘Everything you do in the community is a big deal.’ He said small things that can make big differences. He used his own personal story as an example. Something as simple as voting for business of the year allowed him to experience every child’s dream and allowed him to hear his father tell him how proud he was of him. Also receiving awards were, Chairman’s Award – Mark Waters – UPS Store, Ambassador of the Year – Jen Miles – Tech4Life, and Impact Award – Debbie Burdick – CCUSD Superintendent.